Here you will be able to catch up on UK community news as well as read reflections/blogs from HKAN members about some of the past HKAN events. If you would like to write about your personal experience of a UK HKAN event you attended please do not hesitate to Contact us. For details of past or upcoming events please see Reunions & Events. * We endeavor to give adoptees a voice and hope people can do that here. However blogs, posts and comments may not reflect the views of HKAN. It is the responsibility of a contribute to make sure they have permission to use information and imagery, however if something has been posted without your consent please do contact us straight away with a request to amend the content. We hope that you enjoy what is shared here. This is about a very special home in Hong Kong called, “The Home of Loving Faithfulness”. Two Ladies Valarie Conibear and Wendy Blackmun originally met and worked at Shatin Children’s Home before they opened up the Home of loving faithfulness for the disabled children . met up with Jemma, her partner Sandy and Sandy’s nephew (also Canadian, now living in London.) 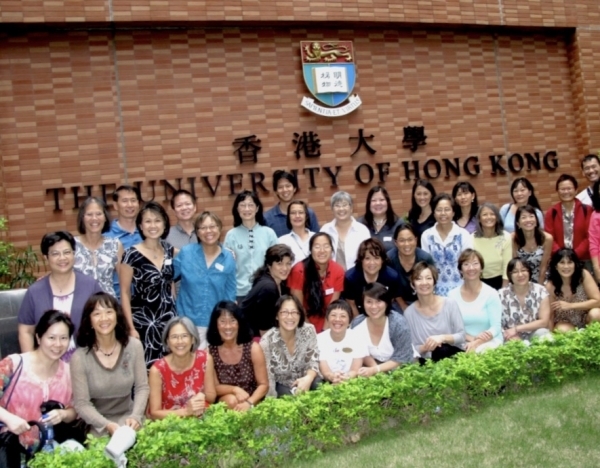 I discovered that everyone else attending, had at points in the recent past met Jemma either at a Hong Kong Reunion or in the United States, so if you’ve been to any of the overseas Reunions, you may have met Jemma and her partner Sandy. We met-up at New World Restaurant in Chinatown for a lunchtime Dim Sum, which is the Chinese equivalent of a Greek Mezze or the Spanish Tapas. Trolleys of Chinese delicacies (savoury and sweet) on little dishes that have been steamed or fried are pushed around the restaurant and diners choose as many or few as they fancy. I first went to New World Restaurant, nearly forty years ago, and the dishes were pretty much as I recalled: varied and delicious! Jemma has some rudimentary Mandarin and was able to request certain dishes and provide some translation. This is truly a fabulous way to spend some time together and incredibly cheap, it worked out at £10.80 per head! We then wandered around to Wardour Street to Bubblewrap for waffle cone ice cream. Bubble waffles, part of the street food scene in Hong Kong, originated as a way to use up broken eggs, which couldn’t be marketed, flour and milk was added to make a batter and these curiosities were born. They are a new trend on the London foodie scene. It was a lovely day out, I then headed home, but the others strolled through to Covent Garden and explored, before eventually heading to their respective homes. What a really brilliant way to spend some time together, and refresh old friendshipsand make new ones! I’d definitely recommend Dim Sum, if you’ve never tried it. I would like to thank Jasmine, Sue and Kate for organising the London Reunion on the 18th February 2017. Also for Claire who printed out the signs and writing the blog. Thank you to Chungwen who was our speaker for the day and Julia Feast (BAAF) who has been such such a big support to our group. We were also delighted to have as a special guest Mrs Tan Yuen who worked at St Christophers Children Home in the early 60’s. 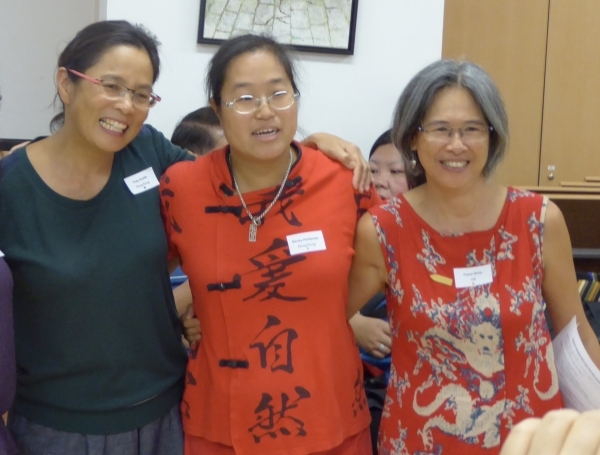 Thank you to the Chinese Community Centre, Church of St Martin-in-the Fields for letting us use there facilities for the day and for to the two wonderful ladies who cooked our tea. Lastly I would like to thank all of you, who attended yet another very successful reunion and I look forward to seeing you again at the next. Please watch this space. 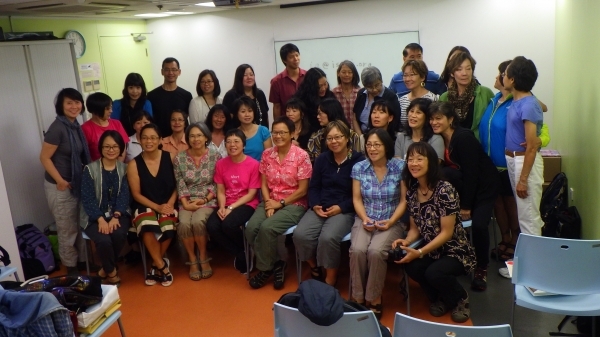 We adult Hong Kong adoptees had another wonderful reunion last Saturday, 18th February 2017, and a couple of us had a titter at some of the absent Other Halves daring to ask the question, “What’s the purpose?” Purpose? We need a purpose? Although we missed some familiar faces (we thought of you and raised a glass of something or other in your direction), we had a great turnout. We are so grateful to Jasmine for pulling out the stops and finding us a new venue in the crypt of St Martin-in-the-Fields Church slap bang in the middle of London (by Trafalgar Square). Even I could find it and my ability to get lost is legendary. In fact, to be on the safe side, we posted red arrows all the way to the hall we were in. Debbie, our UK Hong Kong Adoptee Network founder, was not taking any chances. Sue and Kate were in support as ever and it was delightful to meet other members of Kate’s family. 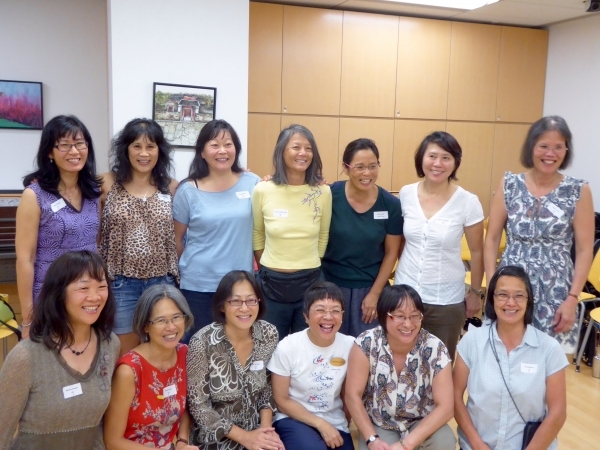 Over the years, at each reunion, we learn things we did not know before. We learned why we were left to be found (refugees from Mainland China – thanks for nothing those who told me growing up that my first mother was probably a prostitute), how we were looked after by the helpers in the orphanages, who has managed to trace blood relatives and how they did it and what we have all experienced growing up in English families. This time we were amazed to discover that our story was part of someone else’s. We featured in the 80 year history of British Airways flying to Hong Kong from London. In all our glory, there we were, in an exhibition in Gerrard Street, London’s Chinatown, called “A Tale of Two Cities”. A few of us went to the launch do on Valentine’s Day and met some local Chinese dignitaries, BA execs and some current cabin crew. We asked if they could find out who the air hostesses were who brought us over, looked after us during the flight from Hong Kong to the UK all those years ago, and featured in our newspaper photos. As well as being able to wander around the exhibition, Chung-Wen delivered a slide show on the Chinese Diasporic Workforce in the UK, a project similar to the one she has in mind for us, where she interviewed people from many industries and professions, to capture the Chinese immigrant experience over many years. One was a merchant seaman in WWII who recently died, giving a sense of urgency to our own stories now that many of us have lost our adoptive parents as well. She traced back to the very first Chinese person to come to the UK in the reign of James II, testing our knowledge of the subject. We were woefully ignorant which I put down to our isolation growing up and the discovery of all these Chinese organisations goes to show we are still not embedded in the Chinese community here. Spread around the country, often the only Ethnic in the village, we fought our own battles against prejudice and, as we discovered this time, put our British nearest and dearest through it as well. And people wonder why we are making up for lost time now? We went back to the crypt for an authentic Chinese meal (prepared by two wonderful women of the Bishop Ho Ming Wah Association), a good natter and to celebrate Naomi’s birthday. Our reunions have evolved over the years. We reminisced about our first encounters, that rabbit-in-the-headlights experience intruding into groups forged at earlier reunions, discovering there were loads of us at the BAAF book launch, comparing adoption records, giggling over not being able to remember each other’s names, the endless selfies and group photos, dipping our toes into Facebook and keeping in touch electronically. We realise we were once together, more than fifty years ago, staring at the same ceiling, eating the same rice gruel, playing with the same toys, flying half way round the world together. The elation of finding each other still has not worn off. We were there for each other then, we are there for each other now. For half a century, Hong Kong-born adoptee Joel John Roberts spent his entire life not knowing the identity of his parents. But as others rehomed by charities such as Po Leung Kuk or orphanages such as Fanling Babies Home have shared their experiences, Roberts, who was abandoned at 15 days oldbegan his own “journey of discovery”. 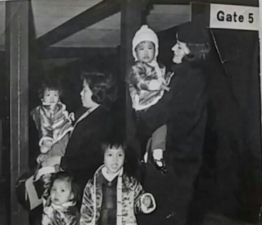 Roberts was one of many children born in Hong Kong in the 1950s and 60s adopted by western families and taken to countries such as the UK, Canada and the United States. Roberts was adopted by an American family and moved to the US aged two and a half. Documentation from this ­period is often hard to come by and his recent attempt to gain full disclosure from the Social Welfare Department about his early life was met with blanks. It sent him hundreds of pages with vast amounts redacted. The problem stems from the context of the Personal Data (Privacy) Ordinance for adoption which protects parents and adoptees from having their ­personal information released. Despite the redactions, some precious details were yielded. Roberts’ original name was Frank Brown, or Pak Fat-lan in Chinese, according to the nanny assigned to care for him on his parents’ behalf. It suggested the name was given by a western father, and it was this name that was reported to police when he was abandoned. The Eurasian ethnicity filtered into media notices, government, and adoption agency filings. Adding to the curiosity of his original name, Roberts took a DNA test because he was not ­satisfied with official documents describing him as Eurasian when he did not have any features to back that up. The results said he was 97 per cent Asian. He also managed to track down an article from a Chinese-language newspaper from the 60s that published the name of his mother, but not his father. 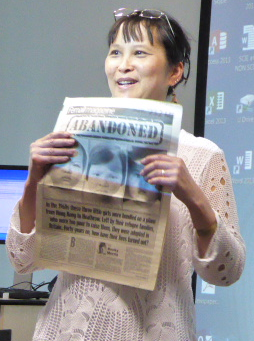 Officials have been found to be inconsistent with redacting adult adoptee reports. As late as 2014, individuals could get full SWD documents without redaction, according to Winnie Siu Davies, who has assisted in previous cases where full unredacted documents were provided and birth parents were traced. The Post covered the case of Mandy Horst in 2014 who used unredacted SWD documents to track down her mother via YouTube. The inconsistencies added to Robert’s frustration and plea to have the documents unredacted. Rebecca Holdaway, who helps returning adoptees from the UK and US, said early separations made it difficult to trace parents. Asked whether it would relax the rules, the SWD said Roberts was not the owner of all of the data disclosed in the documents which it controlled. Since 2006, the department has given birth parents the choice of revealing their identity to their adopted children, but no retroactive mechanism could be created to address historical issues faced by adult adoptees. The United States and the UK created an open adoption disclosure process where both adoptees and parents have a veto and consent rights to communication and the right to know, whereas Australia was on the other end of the spectrum with a “closed adoption” practice and the biological parent’s names are never revealed, said Holdaway. 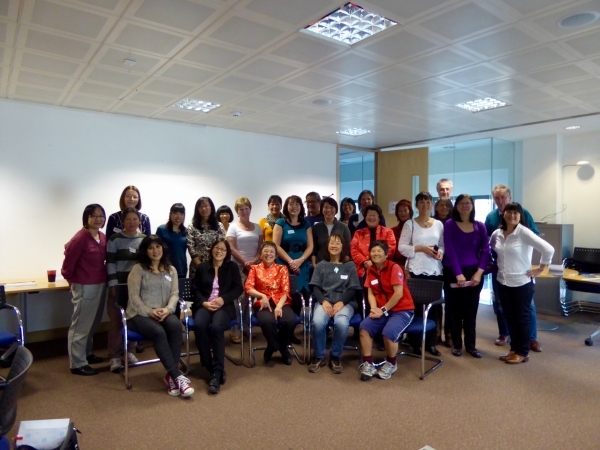 Can you believe 5 weeks has passed since the UK HKAN met in Birmingham! We were given the use of Southside BID’s Board Room – a really lucky stroke given its proximity to New Street station (Grand Central). We were also fortunate in our speaker, Irene Henery. 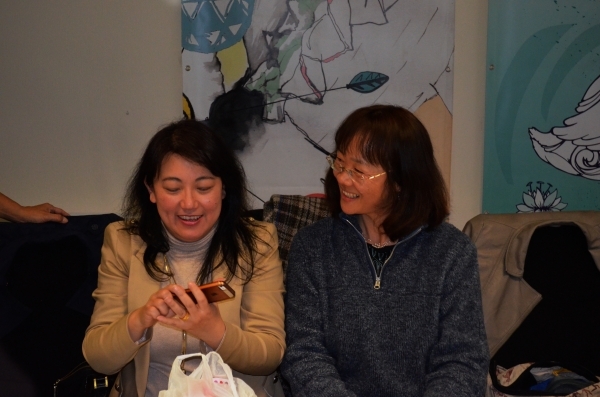 Irene is a well-known businesswoman in Birmingham’s Chinatown, being the accountant for Ian Henery Solicitors Ltd which she helped husband Ian to set up. 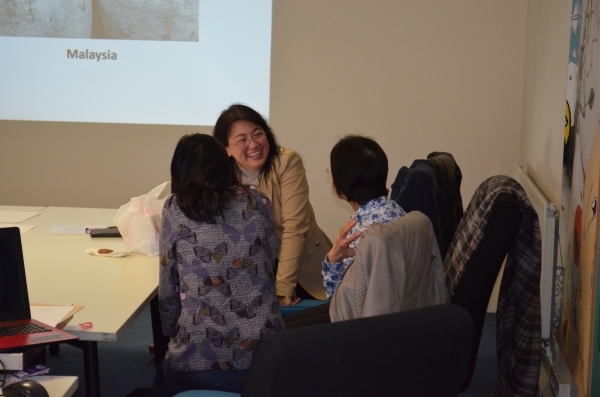 However, we had invited Irene to talk to the group about their experience of adopting from China. Being Malaysian Chinese, we felt that Irene would offer some different insights and we weren’t wrong! Irene already had two daughters when, prompted by a heart-breaking news story of a baby girl abandoned and left to die on the street in China, she and her husband decided to adopt from China. Irene described the lengthy and arduous vetting and preparation process in the UK which is not adapted for prospective adopters who are Chinese. The experience in China echoed that of our previous speaker on this subject Annabel Stockland who had also been presented with a baby that did not resemble the child in the photograph. However, Irene was aware that rejecting a baby in a Chinese orphanage will quite probably lead to that child being condemned to suffer neglect leading ultimately to death. Therefore they accepted the child unconditionally. Irene also spoke of the neglect that Emily had clearly experienced. Emily took to Ian immediately which caused some practical difficulties; however, over time, Irene developed her own relationship with her daughter. Irene spoke about Emily growing up and fitting into family life. She is now a very typical Western teenager, but she has direct access to Chinese cultural heritage through Irene. Irene described the ‘tough love’ and strict discipline found in traditional Chinese families which has been one of the motivating factors in her life. She suggested that this might challenge a commonly held belief within the transnational/transracial adoptee circle that we have lost a valuable part of our culture. In particular, the devaluing of girls and women in traditional Chinese culture is something that we should not miss. Irene’s presentation was highly appreciated, both for the frank but warm recollections of her family’s adoption story, and for the insights she gave us into the difficulties of being born a girl in Chinese society. The presentation stimulated many questions and discussion. Before Irene’s presentation, we had done a warm up activity. In pairs, each person had 3 minutes to look at their partner’s face; they then had to draw it from memory. Returning to the drawings after Irene had finished, the ‘portraits’ were numbered, and we all had to guess who was who. The meeting ended with the usual mixture of news and greetings from absent friends. Julia Feast had sent a message notifying us that the merger of BAAF with Coram had not worked out well for her so she would be leaving. Sue passed on news from Jasmine Gillies who has been liaising with the Ming Ai Institute who are acting as curators for a British Airways anniversary exhibition celebrating 80 years of flying between Hong Kong and the UK. 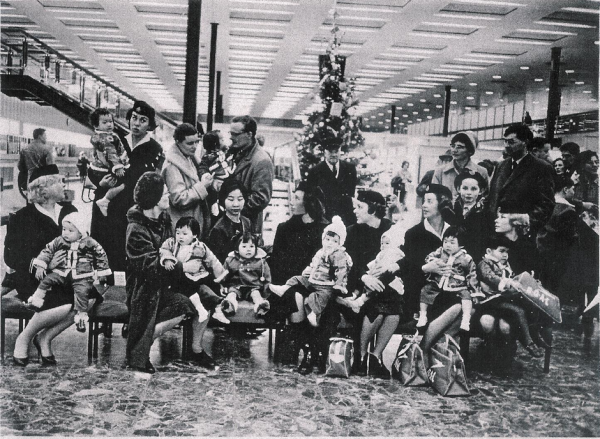 The exhibition will include a feature on the Hong Kong adoption programme in the 1960’s. Chungwen Li, Dean of the Institute, had issued a request for any photographs and newspaper articles featuring BOAC, the precursor to British Airways. 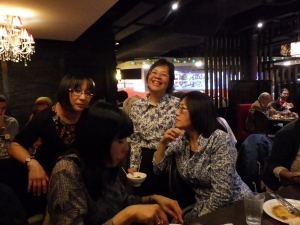 After the meeting closed, we all headed off to Ming Moon Buffet restaurant for an enjoyable meal together. Our thanks to Southside BID for providing us with the meeting room with refreshments and facilities, and to Irene Henery for putting so much thought and time into her presentation and taking part in our group activity with such a spirit of fun. Can I interest your members in supporting this charity The Good Rock Foundation set up by Jacqui Shurr who adopted her daughter from China and then decided to support Chinese orphans full time by her and her doctor husband moving there. They are very good Christians and realised that the adopted ones are much luckier than the ones who are left behind, and many left behind are disabled. Unfortunately the Chinese govt is forcing them out of mainland China so they are moving to HK to continue their good work. I hope some of your members might be interested in supporting them. I have been supporting them before I had Emily and I am always impressed by how faith can inspire wondrous acts. Another link I can recommend is www.dramafever.com for anyone who wants to watch Chinese TV series with English subtitles – easiest way to learn Mandarin! If you go for the historical dramas you will learn some Chinese history and culture. I cross reference with information from Google. I am currently watching “Prince of Lan Ling” and find it fascinating that he was real, although the producers have obviously added a fictitious love interest. If you watch it on your iphone it is free and has no advertisements. If you watch it via a laptop there is a lot of ads unless you pay a monthly subscription. Did you participate in the British Chinese Adoption Study? If so, would you like a copy of the transcript from your interview? Julia will send you more information about how this can be arranged. On route to venue a few of us were able to enjoy a few distractions as we walked through Trafalgar square. St. George’s day celebrations were taking place which were marking Shakespeare’s 400th anniversary. 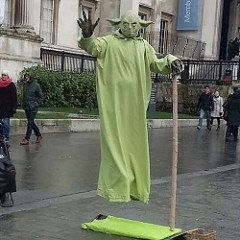 Yoda also made an appearance! Apologies go out to those of you who had difficulties finding the venue. If only we knew there were going to be bag pipers playing outside the building! Kate got the afternoon off to a good start with a warm up activity. We were asked to show how we felt at the time. Look at the smiley faces! 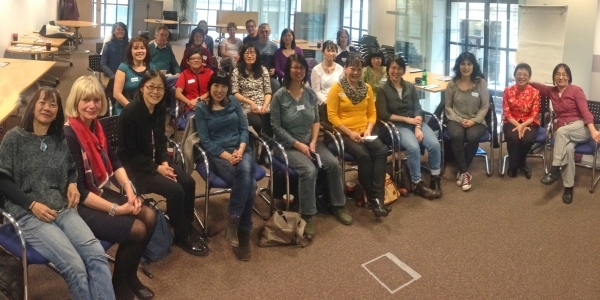 We really appreciated that Julia Feast could join us to give an update on BAAF and the British Chinese Adoption Study http://corambaaf.org.uk/ourwork/bcas This is the project Julia led which quite number of UK HKAN members took part in. As a result of the project many of us became aware that there were other UK Hong Kong adoptees and the BAAF events helped bring us into contact with one another. Unfortunately Margaret Grant, Senior researcher was not able to attend the meeting but she sent an email to for Julia to read out. In her email Margaret explained that the research team has been working on further analysis of the data on adult life events (partnerships, children, relationships with adoptive family, work/education etc.). The results are being reviewed at the moment and they hope to publish further papers to add to previous publications. Margaret also did two short presentations at the International Conference for Adoption Research in New Zealand in January, including one about the impact of the BCAS study. People were very interested to hear about UK HKAN’s development and the connections that have been forged between women (and their family members) via the network. Serena suggested a panoramic photo and we had a bit of fun when she asked Julia if she could take one of us. Realising camera wasn’t turned on! It’s a lot of pressure to put on one person. We got there in the end and as you can see there was a good turnout. 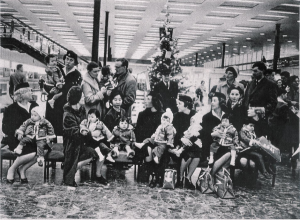 We were very privileged to be able to see a video featuring St Christopher’s Babies Home and the amazing Muriel Tonge, who was the Supervising Nurse at St. Christopher’s during the early 1960’s. The video gave us an incredible insight into what it was like at the orphanage at that time. Find out more about Muriel in a book written by her granddaughter. 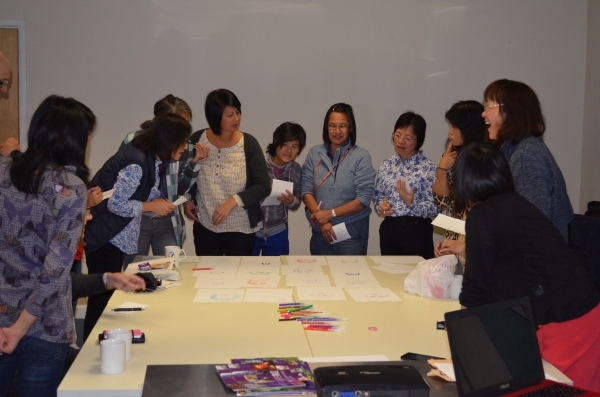 Debbie led the group sharing activity which was a very heart-warming experience. 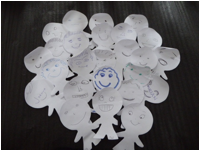 In preparation for the meeting we were all asked if we could provide a picture or bring in an object which had special meaning for us in the context of our adoptions. Photos included the earliest or one and only photograph we have of ourselves as a baby; a view or image of the original orphanage where we lived before being adopted and more recent photos of the area as it is now; us at the location where were left as a baby or standing by the street sign of where we were found; us in a photo with our adopted family or our own family celebrating a special occasion of one of our children; and us celebrating ourselves doing what we enjoy as an adult. We were then shown precious objects that hold their own stories and memories. We also got to see newspaper cuttings and magazine articles featuring the arrival of some of us and the families we were going to be part of, and also other press cuttings which were promoting need for more prospective parents to adopt from Hong Kong. Newspaper article “A new love for nine orphans’. My demonstration of the mapping exercise enabled everyone to see where other adoptees were left/found in Hong Kong. 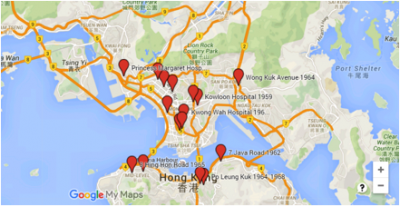 It was interesting to see on the map the cluster of locations in the New Territories and those of us who were left at hospitals or at the orphanages themselves. The mapping exercise is work in progress and I would like to have more information added to the map. Currently the map gives street locations, date left/found and orphanage(s) sent to. Additional information could include as age when found and age when leaving Hong Kong and the country we were adopted to. Kate raised a very important point at the meeting about privacy and confidentiality. 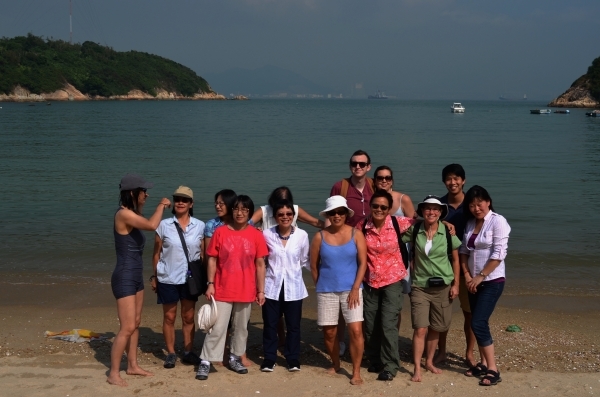 Since coming back from the 2015 November Hong Kong reunion two people were told that they have been identified in group photos that have featured in videos/documentaries. Both of them had not given their consent. It was made clear that this is not acceptable and that UK HKAN makes every effort to respect the privacy and confidentiality of other adoptees. Not only are our experiences very diverse, but many of us do not want to search for our birth families, which is what these videos/documentaries are showing. Our meeting finished with an all group photo – and here is! Many thanks to all of you who helped organise the event and for setting up the room and clearing up on the day. A special mention goes out to Tracey for greeting us all and handling registration and to SCIE http://www.scie.org.uk for letting use their offices for our meeting. Who’s the brave one that went for a swim! Does anybody else have any good pictures they would like to share with captions, please send them to me and I will try and get them on the on this Site! 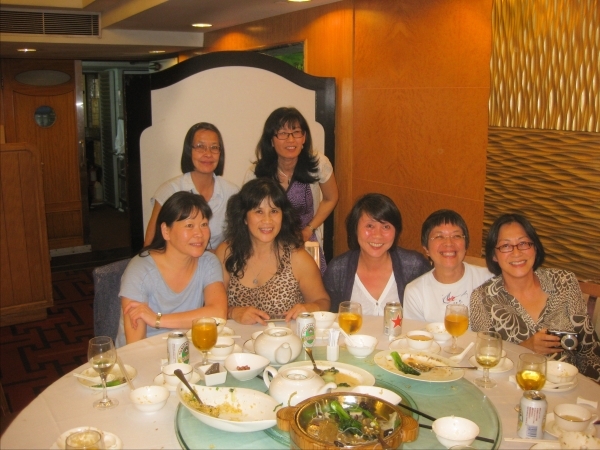 Around 2011, a few of the Hong Kong adoptees toyed with the idea of finding somebody interested in making a documentary about us. I approached both the BBC and Channel 4 with fellow Fanling-er Lucy. No joy. In the end we decided to make our own. I withdrew due to other professional commitments but Lucy ploughed on, expanding the vision to include British Born Chinese interviewees that had very similar experiences to us of being in a “cultural No Man’s Land”. It’s now doing the rounds of the film festivals but there’s a rare chance to see a screening at the School of Oriental & African Studies (SOAS) in London.